I got to bring home two adorable little girls for school. I'm going to school to be a vet tech and these girls where used in the lab animal classes. At the end of every term some of the lab animals (rabbits, mice, and rats) go up for adoption. Originally Rutabaga was Ratabaga. I changed her name to Rutabaga, because I like the name more. I also switched their names, because I thought Zucchini fit the smaller girl better. Zucchini is the girl with a gray head and Rutabaga is the girl with brown. Re: Meet Zucchini and Rutabaga!!! Wow, they are very cute and love their names. I haven't been on Goosemoose in ages and miss seeing all those cute faces. I'm going to have to visit more often. Zucchini gets so talkative when I pick her up. We're working on them being okay with me picking them up. Zucchini will eat the treat I give her, but Rutabaga waits until she is back in the cage to eat her treat. Someday I want to see if they will eat the veggies they were named after. Adorabubs! Good luck with your studies! I'm laughing because a lot of people don't like rats, so we have a family "safe word" for them such as when we are out eating. And it is "rutabaga." As in, "have you fed the rutabagas yet?" Precious! 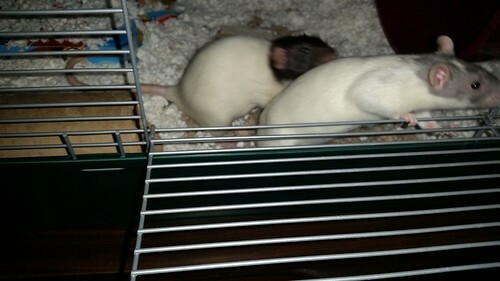 I have my own veggie rats - Turnip and Ginger and their sister who has passed: Radish. Finally tried to have all my ratties together. It didn't work. Tobi seem to want the girls to leave him alone. They were running around exploring and Tobi just wanted to eat. I was keeping a close eye on Tobi, because he was puffing up and pushing sideways against Zucchini when she got too close. Eventually Zucchini was playing with Rutabaga, got too close to Tobi, and Tobi struck. (I don't want to say they attacked, because there wasn't any injury or blood. After removing Tobi from the cage for a couple minutes I put him back and was watching him. I then heard a squeak and fighting happening in the top half of the cage. Irish and Rutabaga were going at it. While I have read many time that you should wear thick gloves or use a thick towel to stop a fight, I never do that. It's amazing that I haven't been bit. I just stuck my hand in between the two. Rutty(Rutabaga) was on her back and Irish was on top of her. With my hand in between them they just looked at me. I feel like it might not have been as big of a problem as the first fight, but I also haven't had to deal with loud play fighting for years. I'm not sure if I'm doing any of this right. Intro's really need to be done in a neutral area. I always used the bath tub. The first few times would only be 20ish minutes (less if there were issues), and then I'd work my way up. When they are ready to move in, everything needs to be scrubbed down so it doesn't smell like any of them. Scrub the cage down and spray with vinegar so it doesn't smell like any of them, same with toys, food dishes, etc. Wash anything fabric with some vinegar in the wash as well, to help get any residual smells out. They've hung out outside the cage a couple times before. They didn't have any problems the last time they were in a neutral area. Had you totally scrubbed down the cage and everything in it before adding them? Rats are territorial, and it really does needs to be a neutral area before you move them in. 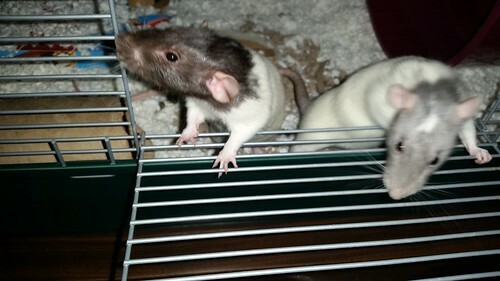 This isn’t my first time introducing rats. Over a year ago I introduced Irish to Tobi aand Pasquale without a problem. Don't break it up if there's no damage being done, or there are more serious signs, including audible hissing, sideways sidling and somebody going for another's rear end or tail in earnest, as opposed to flipping each other over or going for neck or back. Squeaking in protect is OK. Screaming is not. If you break it up prematurely, the rat with bad manners being taught a lesson or the less dominent thinks, "Wow--that move really worked! They didn't just submit they disappeared entirely!" and they have to work it out all over again. I find it helpful to slather necks and butts with real vanilla, and drip a little over the back from above with finger flicks. It can also help to put a BIG box open on one side, or a BIG igloo in the neutral play area. A small igloo can CAUSE fighting, but a big one can encourage them to get closer! Thanks, Mountain~ If I can actually be awake during daylight tomorrow I plan on having them all out to play while I clean. I have a big box that I'm sure they'll like. My bedroom doesn't have a ceiling light and I don't have a lamp, so without sunlight the room gets pretty dark. I heard one small scuffle in one of the big boxes, but that was it. Okay. I did a thorough clean of the cage and everyone is together. There have been a few scuffles, but not much squeaking and no blood. Rutabaga seems to want to be “Top Rat”. Tobi appears to have decided that he’s too old for this and has taken to sleeping in the space pod. Zucchini seems mostly neutral, but she did pin Tobi at one point. Last we have Irish. Irish doesn’t want to be under Rutabaga. He and Rutty had the most intense scuffle. It scared me, but there was no blood. At one point it looked like they became a ball together and rolled a little. Zucchini almost got involved, but decided not to approach Irish.